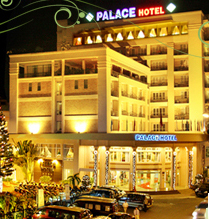 Our four star Palace Hotel is located in the heart of bustling Vung Tau city. It is in very close proximity to local offices, famous tourist attractions and entertainment centers. The Palace Hotel is also the ideal venue for seminars, conferences, banquet group dinners and cocktail parties. It is our privilege to welcome high-ranking officials and diplomatic delegations. Our hotel has emerged to be the most popular choice for important events to be held in the city.Our restaurants offer extensive a la carte menus of award-winning Vietnamese, Asian and Western cuisines. Private dining rooms are also available. The main hall can accommodate up to 800 banquet style and includes bars and coffee lounges. There is a Casino within the Hotel premises, equipped with the latest and most exciting electronic games for you to wager. An adjourning Bar at the Casino allows relaxation and listening pleasures to the evergreens of the '70s. Our professional chefs are proud to serve renown specialties that have been awarded Gold Medal and Special-Winner Prizes at several National Food Contests. Whether you are coming to Vung Tau for business or pleasure, we offer you a comfortable and enjoyable stay. - If a little snack and lots of ambience is what you have in mind. The Palace restaurant features international favourites and Asian specialities in a cosy environment that reflects the ambience of Asian culture . Private dining rooms are also available.